At Macy’s, Inc., we pride ourselves on being a top employer in every location where we do business. We offer competitive pay and benefits in a caring and service-oriented work environment. Ready to Explore Career Opportunities at Macy’s, Inc.? We invite you to explore the links below to learn about opportunities at Macy’s, Inc. Search for open jobs and, when you’re ready, apply online. Discover the range of career opportunities that Macy’s has to offer. Interested in joining the Bloomingdale’s team? View job opportunities at every level within the organization. macysCOLLEGE.com highlights internship opportunities for students and full-time employment for graduates through our Executive Development Program. Bloomingdale’s also offers college internships and full-time career opportunities for graduates. Join our dynamic team in Macy’s Technology, one of the fastest-growing businesses within the company. We offer opportunities in creative, marketing, technology and merchandising in San Francisco, Atlanta and New York. In 2018, Macys.com was recognized for the third consecutive year as one of the Top 25 Companies for Women Technologists by AnitaB.org, which aims to recruit, retain and advance women in technology. Macy’s was identified as one of the Top 50 Best Companies for Diversity in 2018 by Black Enterprise. Macy’s, Inc. has a perfect score on the Human Rights Campaign Foundation’s Corporate Equality Index, the annual scorecard and national benchmarking tool on corporate policies and practices pertinent to lesbian, gay, bisexual and transgender (LGBT) colleagues. The HRC also selected us as one of the Best Places to Work for LGBT Equality in 2018. In 2018, Macy’s, Inc. was awarded America’s Top Corporation, Gold Level, by the Women’s Business Enterprise National Council for its efforts in advocating and promoting women owned businesses in Macy’s, Inc.’s supply chain. 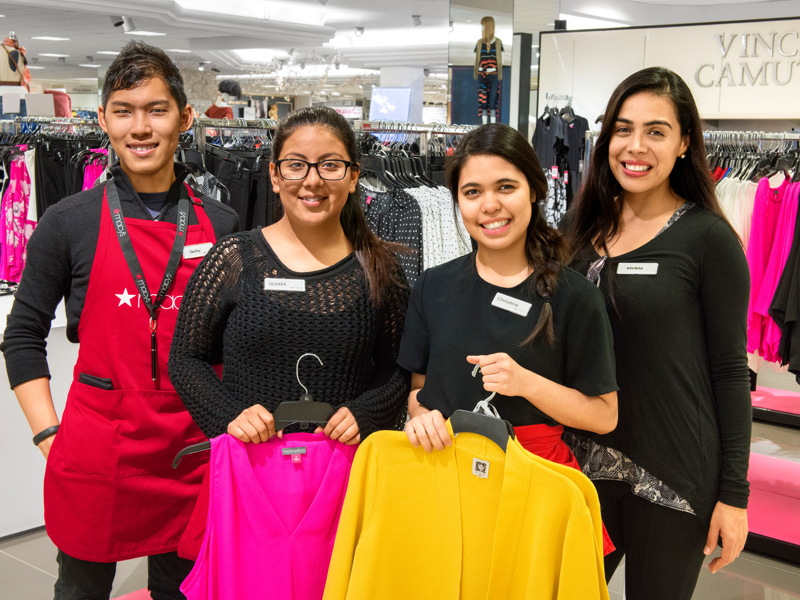 Macy’s was named a 2016 MBN USA Champion of Supplier Diversity for its staunch efforts in driving growth in supply chain diversity and inclusion. Laurene Gandolfo, executive vice president, Home Private Brands; Elisa Garcia, chief legal officer; and Deirdre Connelly, Macy's, Inc. board of directors named among the 2017 50 Most Powerful Latinas in corporate America. Macy’s, Inc. received the Special Corporate Award in 2017, for its continued support and commitment to the NAACP New York State Conference. Shawn Outler, executive vice president, chief diversity officer, and Felicia Williams, executive vice president, controller & enterprise risk officer, were named to Black Enterprise’s prestigious “Top 300 Most Powerful Executives in Corporate America” list (Nov./Dec. 2017 issue) for their career excellence and corporate leadership. Macy’s named one of the 2017 Top Companies for Supplier Diversity in by Black Enterprise. Macy’s named to the Million Dollar Club by the United States Hispanic Chamber of Commerce (2014 through 2017). Macy's, Inc. recognized by MBNUSA Magazine as a 2017 Champion of Supplier Diversity. Macy's, Inc. recognized as 2017 Corporation of the Year by the Ohio Minority Supplier Development Council. 2016 MBN USA Corporate 101 recognized Macy’s as one of America’s Most Admired Corporations for Supplier Diversity and a Champion of Supplier Diversity for its staunch efforts in driving growth in supply chain diversity and inclusion. Macy's, Inc. received the 2015 UNCF President's Award for its support of UNCF as it works to strengthen the pipeline of African American students who go through college and become tomorrow's leaders. Macy’s, Inc. received the 2015 Frederick Douglass Medallion, the New York Urban League’s highest honor for individuals and organizations that have contributed in a wide variety of ways to the causes of social justice, education and equality. The medallion was presented at the 50th Anniversary Frederick Douglass Dinner, which pays homage to the annual fundraiser’s namesake while celebrating modern day heroes and companies that embody Douglass’ commitment to equality for all. Macy’s named a Top Supplier Diversity Program by the Black EOE Journal. Macy’s, Inc. is 130,000 strong, with thousands more seasonal colleagues. Our people help us make life shine brighter for our customers. As one of the nation’s top retailers, we strive to attract the best talent by offering competitive pay, benefits and paid time off, and a generous employee discount, as well as the opportunity to create a meaningful, dynamic career experience. The majority of our colleagues, full-time, part-time and seasonal, are eligible for our Path to Growth Incentive. At Macy’s every job matters, and the Path to Growth Incentive Plan recognizes that every colleague has a role to play in driving our success. The Path to Growth Incentive is tied directly to measurable goals that align to the colleague’s work area. Giving Back is one of our core values. This means showing up in times of need and taking care of the communities we’re a part of. When our Macy’s family is the community that needs support, initiatives such as the North Star Relief help our colleagues take care of one another. Macy’s, Inc. learning and leadership initiatives encompass a broad variety of topics. This includes personalized, social, on-demand learning in key areas such as leadership, professional and technical skills development. We also have a best-in-class in-house Leadership Institute where we deliver targeted development annually. Each year we make significant investments through our learning and leadership initiatives to continue to grow and develop our talent. We encourage colleagues to share feedback that will help us measure engagement and understand how they’re feeling about our culture. For example, the Culture Pulse survey series has enabled our progress by helping identify the areas where we are doing well and the growth opportunities that, when realized, will help colleagues and People Leaders get better every day. Coast to Coast is an online newsletter available to all colleagues that enables and empowers Macy’s, Inc. colleagues to be part of the latest company-wide conversations. Featured topics include our people and business, innovation, diversity and inclusion, and, of course, fashion.